POPDB and Richmond Continuing Ed offer a 300 hour Deafblind Intervention Certificate Program. Deafblindness is a low-incidence disability that requires specialized training to understand the unique needs of the student and to learn the strategies/techniques in the field of deafblindness. 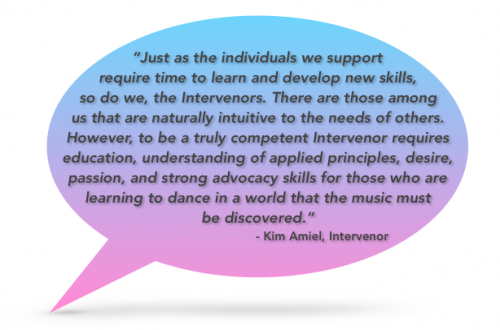 The role of the intervenor is different from the role of the Educational Assistant (EA). This difference is addressed within the Deafblind Intervention Certificate Program. The program is comprised of nine courses and one extended practicum and into three steps. For detailed information on each course, click on the link beside the course number. Introduction to Deafblindness and Introduction to Intervention are considered to be minimal requirements for anyone supporting someone with deafblindness.